Today, Microsoft shipped a Beta 2 build of the new graphics design tool, Expression Design on Microsoft Downloads. It appears that none of the official websites has been updated to reflect this yet. Just as I was writing this post, the official Expression website was updated to reflect the availability of this new beta. This new beta does not seem to contain any major enhancements compared to Beta 1 which was a significant leap. Apart from the described support for the Release Candidate version of Expression Blend and enhanced XAML export capabilities to support .NET Framework 3.0, there are no visible user interface changes or changes in key capabilities. Even the accompanying readme file still reads “Beta 1”. One of the features still lacking is Scalable Vector Graphics (SVG) file support, which should go hand-in-hand with vector designs. Hopefully that will come before RTM. Expression Design is a new endeavor for Microsoft who’s never produced a graphics-creation application by any standards in the past, that is if you don’t count Paint. 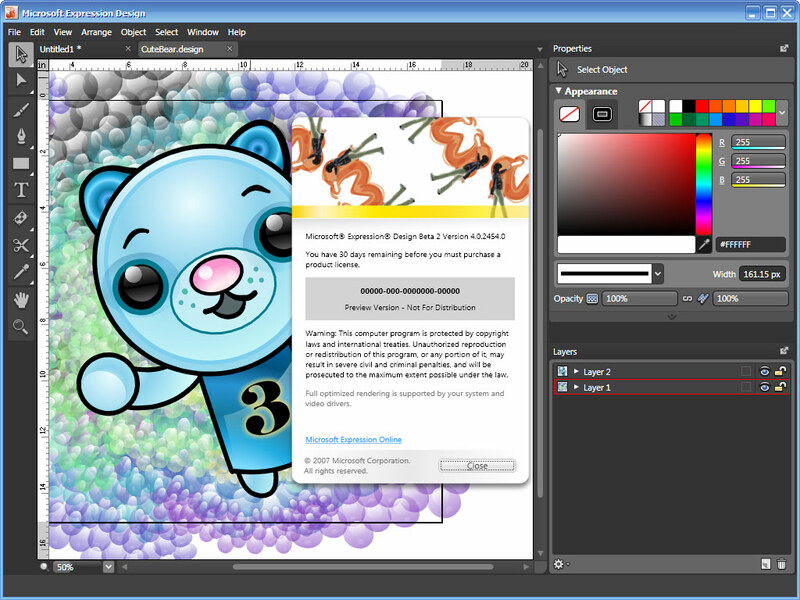 One of the key features it offers is the hybrid availability of both vector and bitmap tools in the same workspace, whereas Photoshop and Illustrator complimented each other separately (although each contained a bit of the other). Whether that is of any significant use to designers is yet to be properly explored. But probably the biggest and most sounding benefit of using a Microsoft-built design tool is the integration of XAML technologies. It makes sense to join the dots between a Microsoft-developed technology (XAML/WPF) with a Microsoft-developed tool, in theory at least. If there’s any success to come out of Expression Design, it will be from building beautifully-designed applications using XAML. As a self-proclaimed designer, I still use and prefer to use Photoshop for day-to-day design tasks. It’s a combination of habit, familiarity and third-party support (tutorials, plugins). I can picture myself using Expression Design one day to design XAML illustrations for use in WPF-powered software, but that won’t be mainstream for a while. Actually, Microsoft did release a few graphics-editing applications that are – in some way – a little bit more than Paint. There was Microsoft PhotoDraw (part of Office 2000), Microsoft Digital Image Suite (or Picture It! ), and also Microsoft Office Picture Manager (previously Microsoft Photo Editor / Microsoft Imager). @John: True, but none of them are graphics-creation tools. Both were photo-editing tools in one way or the other. I don’t think it will ever have SVG support. That’s not Microsoft’s focus, they want people using XAML. May be if enough users file that as a issue and bug and make a big hoo haalaa, then they might consider it. Does that mean pixel-editing is still gone? @John: Yeah, sadly, it’s still gone. Pingback: Expression Design Beta 2 Released! at BitSticks! Even though it’s lacking, almost all, the image editing capabilites, their are still some interesting things you can do with it.